Sarah and I went to the Nectar Lounge last night to see One Silver Astronaut, an LA band that our friend Pat plays with. 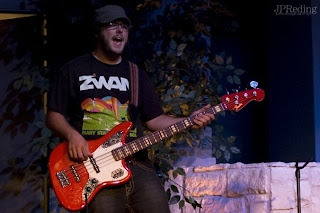 Pat was the worship leader at our church but left last year for the sunny skies of California. The show was good and the place was filled with Pat fans. I wasn't sure I'd like the music but I did. They have a good sound that I am too old to classify. I am just not up on all the modern rock stuff since I don't like about 80% of what I hear. Check out their MySpace page. You can give them a listen there. I enjoyed their set. It was accented by solid songwriting, a stellar drummer, electric violin and nice harmonies. I bought the CD only to find out that the current line-up is not on it hence the current instrumentation isn't as well. Disappointing but I'm glad to support the band. I hope they do well. PS: I got the above pic off Pat's Facebook page. I forgot to take our camera last night. Bummer.